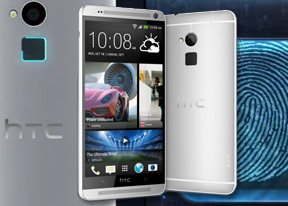 One of the cool new features brought by the HTC One Max is the fingerprint sensor on its back. Unlike Apple's implementation, this one requires you to slide your finger over it, rather than just hold it on top, but it is still quick and accurate enough. The One Max recognizes up to three fingers, which is even more limiting than Apple's Touch ID maximum of five records. As a value-added feature you can assign an app to each stored fingerprint so it gets activated automatically with the screen unlock. That way you can have your index finger launch the phone app, your middle finger launch the camera, and have another finger simply unlock the Max. Unfortunately, those shortcuts are no longer available once you unlock the phablet, which we find to be quite disappointing. To set a fingerprint you need to swipe three times on the sensor. That kinda reminded us of the first times we saw fingerprint sensors on phones - the Toshiba G900 had a similar learning setup. Unlike the G900, the One Max sensor is pretty accurate, but because you need to do a swipe gesture, not just tap and hold, we find it slower than Apple's solution. There are some occasions when you are in a hurry and you are just not slow enough for the sensor to read your finger, which has the potential of getting in your way. There is a quick setting for the Fingerprint reader in the Notification Quick Settings pane. It will take you straight to input a new fingerprint screen if you have a free fingerprint slot. As usual, before you setup a fingerprint lock, you will be asked to enter a password for security reasons. In case you are unable to use the fingerprint scanner, you can unlock the device with that password. HTC One Max runs on the Snapdragon 600 chipset - the same ticking inside the HTC One and inside at least one variant of the Samsung Galaxy S4. It has four Krait 300 cores clocked at 1.7GHz, Adreno 320 is in charge of graphics and there are 2GB or RAM. As usual our first test is all about single-core performance. The Krait 300 score is on par with the S600-running Galaxy S4 devices. HTC One Max repeats the result from our previous test, performing equally to the S600 gang on the multi-threaded version of Linpack. GeekBench 3 is a popular CPU benchmark, where the One Max scores a hair below the original HTC One. Quadrant and AnTuTu 4 gauge the overall device performance instead of just the CPU and the One Max managed to produce the same results the HTC One did earlier this year. We've put the Adreno 320 GPU through the GFX Benchmark. It did as we expected - decent, on par with the S600 Galaxies and One, but noticeably slower than the S800's Adreno 330. The updated Epic Citadel benchmark has the new Ultra High Quality setting and we've re-tested every 1080p device we possibly could. The One Max scored just a whisker below the HTC One. The combined BrowserMark 2 benchmark showed the HTC One Max is once again on par with the rest of the S600 gang. Finally, the HTC One did better on Vellamo than the original One and on par with the Butterfly S.
So, HTC One Max performs exactly as well as you would expect from a Snapdragon 600 device. This is no longer Qualcomm's top-of-the-line chipset, but it delivers excellent lag-free user experience that won't disappoint anyone. The latest top-notch games won't pose much challenge either. Still, the Snapdragon 800 shows its superiority when it comes to web browsing speed and app loading times. It's not a choice between good and bad performance, more like between great and the best, but when you are shopping in this price range the best is often the only one good enough.